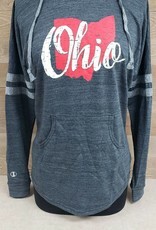 A super cozy sweatshirt to show your Ohio pride. Charcoal grey hooded sweatshirt with light grey stripes on sleeves. Red Ohio silhouette imprint with white Ohio script. Available in sizes extra small through 2 extra large.